Goofy Goober Waiter – From SpongePedia, the biggest SpongeBob-wiki in the world! 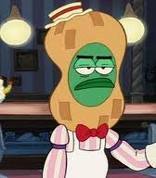 The Goofy Goober Waiter appears in The SpongeBob SquarePants Movie. He works as a Bartender at Goofy Goober's Ice Cream Party Boat, and he like many store workers think SpongeBob and Patrick, are annoying. He had to make lots of Triple Gooberberry Sunrises for SpongeBob and Patrick. He wears a Goofy Goober hat, and a white uniform. It is unknown if he lives in Bikini Bottom. He is in SpongeBob SquarePants: The Movie as an enemy, his broom that he used to clean up is his weapon. He has an attitude similar to Lou. This page was last modified on 22 February 2017, at 21:03.